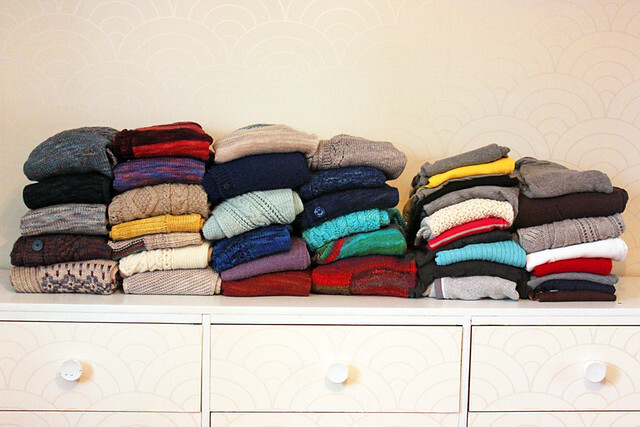 After the holidays I decided that it was time to take stock of the chaos that was my sweater collection. My closet was beginning to burst at the seams with sweaters, many that I didn't wear. There's something about the holiday season that always puts me face to face with the reality of how much excess we sometimes have in our lives. I'm lucky, not everyone has the same generous, gift-a-plenty type of holiday as we do, and though there is nothing I would change about spending Christmas with my family, a part of me is always made especially aware of those who have less - thus making my closet of many sweaters feel quite gluttonous. So, Chris and I cleaned out our wardrobes and donated two big bags of clothing. It felt good. The piles pictured above are what is left of my sweater collection. The four stacks on the left are all hand knit, which makes me happy. There are actually two more, one that I forgot to photograph and my Reverb that I just got back from Brooklyn Tweed last week!) 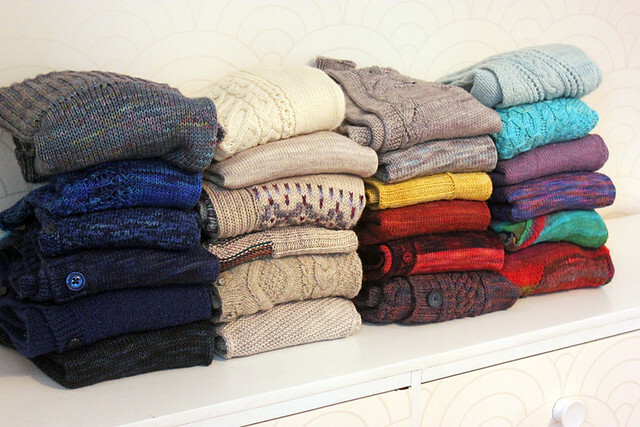 Seeing all of my sweaters together like this is quite neat. Most of my store bought sweaters are lighter weight and truthfully, many of those light weight cardigans get a lot of use, so I think that I definitely need to make an effort to knit myself more light weight sweaters since my collection is predominantly worsted weight. And, since I'm being perfectly honest here, there are a few sweaters in those piles that I couldn't bear to part with, though I never wear... I'm looking at you Noro beauties (this one and this one)! Also, I think that I need to knit a green sweater, maybe even a red one, and I'll go out on a limb here and say that I don't need any more blue... but come on, who are we kidding, there is a very good chance that I knit myself another blue and grey sweater this year.